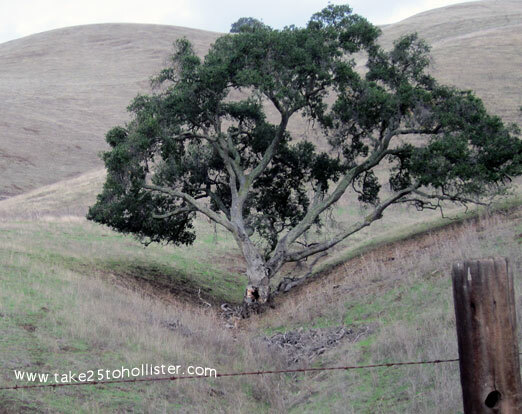 Today's post is a memoir of Bolado Park, written by Robyn Detherage Asimus, who lived in Hollister once upon a time. Robyn wrote this piece several ago for our defunct 1971 Balers website. 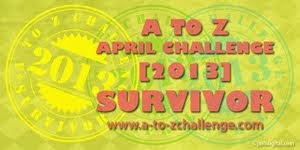 She kindly has allowed me to republish it here. All photos are courtesy of Robyn. Thank you, Robyn! I loved those summers at Bolado Park. I can still remember those magical summers in the 60s as if it were yesterday. . . .
Driving down the long hill from Tres Pinos, the golf course on the left, rounding the last corner to begin your first glimpse of Bolado Park. The long, long grassy area and the rodeo grandstands, pulling into the parking lot, walking up the stairs, through the main doors, and there on the right was the most beautiful sight in the whole world. The unbelievably big, beautiful, blue swimming pool. The water sparkled in the sun. WOW!! How I loved summers at Bolado. Swimming, diving, synchronized swimming pageants. Doing front and back flips off the board, (wearing a tee shirt so that I wouldn’t sting my back), being on the swim team, and practicing until I thought that my legs would fall off. Remember the upper deck sunbathing area down by the shallow end? Of course, us girls never went there. We all knew that the cute boys were at the deep end, swimming, diving, and just sitting on the bench looking good. I loved the hamburgers at Bolado. I always ordered mine with just mayonnaise and pickles. What was I thinking? Bazooka Bubble Gum that was shaped long—kind-of like a tootsie roll, cream soda, Big-Hunk candy bars, and those delicious milkshakes. I have lots of special memories of the employees there, too. Lovey ran the main cash register. (I was scared to death of her.) Cleva Harlan and Vivian Kaiser, sisters, and the main cooks. Frank and Julie Escover: Frank was the groundskeeper and drove the little cart around; Julie was his cutie-pie daughter. Tommy and Francine Medeiros. Did she not have the most perfect ponytail in the whole world? Coach Hardin, Pete Maddox, and Pat McCone were the main lifeguards. 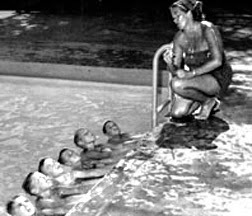 Peggy Slater was the swimming teacher who gave private lessons. Not many people knew that Peggy had taught soldiers in World War II how to swim under the water and avoid the burning fuel on the surface when their ship was attacked. She was responsible for saving many lives. Of course, my grandfather “Pop” Burns, who by the way was also the best grandpa in the whole wide world. He always had a huge set of keys hanging from his side and a hug and a smile for me. 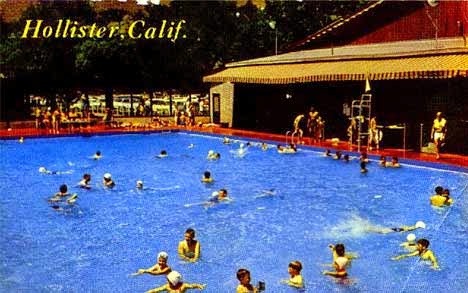 As great as my life has been I would give anything just to step back in time to the 60’s again and spend a day at Bolado Park swimming, laying in the sun and just living the good life again. Today, Dear Readers, you have a wonderful treat. 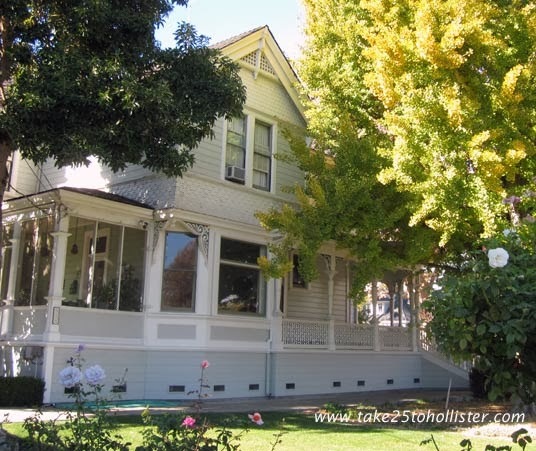 Mr. Bill Sparling of Washington has kindly allowed me to post his story about his memories of visiting his family in Hollister when he was a child. Please, everyone, give him a big, warm welcoming Hi! Hello! and It's a pleasure to meet you. Thank you, Bill! Hollister -- I love the way that city name sort of rolls off the end of my tongue. It is one of those words that almost say themselves -- like Montana and Cumberland. It is also where I did a good bit of growing up. My father was born in Panoche in 1894 and he had brothers and sisters all over that area and many in Hollister. The family name, Sparling, is not unfamiliar to anyone who has lived in Hollister for more than say, 50 years. 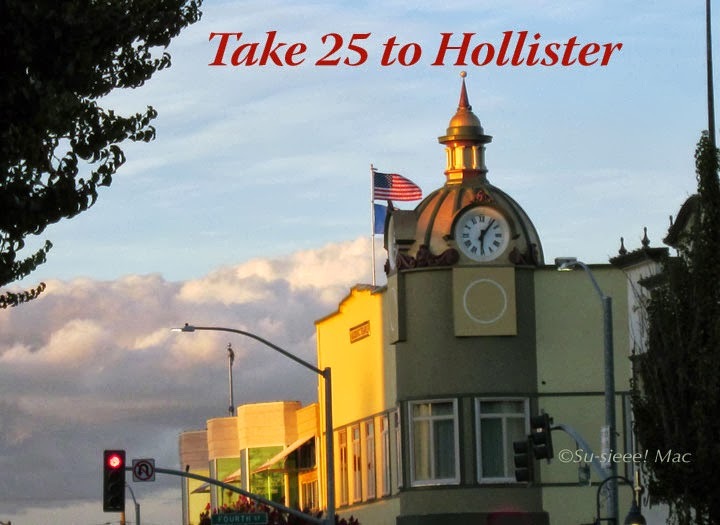 I never actually lived in Hollister but since my dad had several brothers and sisters there, we made the trip from Cupertino (where we did live) to Hollister quite regularly. I had herds of cousins there and many of them were my age and we all got along famously. When I stumbled over this website (Take 25 to Hollister), I was really excited over all of the information and pictures I found on it. The first time I hit it, I spent a couple of hours poking around town, checking out familiar old byways and enjoying “visiting” one of my favorite places. 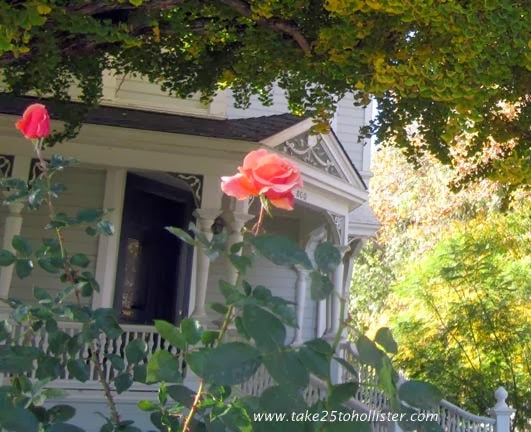 One of the things that really got my memory juices flowing was a picture of a house that was used in the TV mini-series East of Eden. This was no ordinary picture of an ordinary house. This was a place that I had birthed many happy memories. 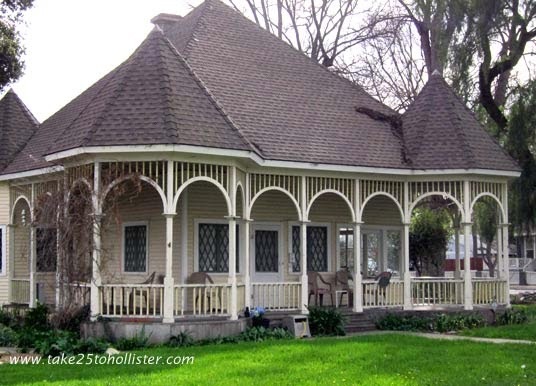 My Aunt Nada lived there with her husband Louis Mays who was President of the Hollister National Bank when I was a kid. Their son, Tom, had some great electric trains and we played with them by the hour in his room and in the upstairs hallway. We used to sneak down the “secret” back stairway that led into the kitchen and snitch cookies my Aunt Nada or Tom’s sister, Nancy, had made. I’m sure they both knew who snagged the cookies but they never let on. 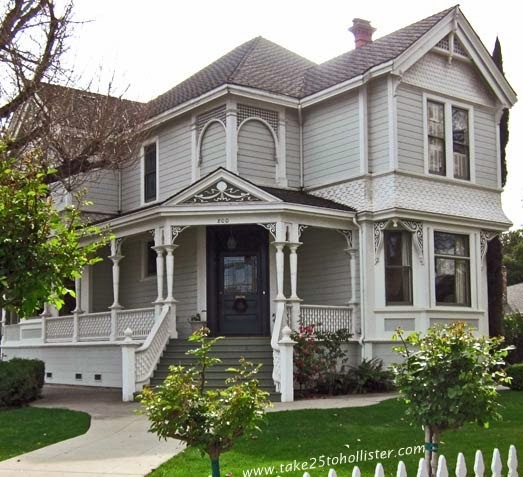 The house is on the southwest corner of Monterey and South Streets and is a beautiful old Victorian house with miles of wood trim as well as shiny mahogany banisters inside. There was a big upright grand piano in the front parlor that I used to play when we visited. The floors were waxed and shiny, and there was a huge stove in the kitchen where Aunt Nada used to turn out some amazing things to eat. I bought a copy of East of Eden just so I could see that house “in action” again. Much of the interior as shown in the movie was still familiar, even after 60 years. Yes, 60 years. The last time I really remember being at and in that house was Thanksgiving of 1949. I was twelve years old. There is a scene in the movie of the Trask family eating their Thanksgiving dinner in the dining room. I, too, ate a Thanksgiving feast in that same dining room, only 32 years before the mini-series was made -- before some of the actors in the story were even born. (Why do I suddenly feel so old?) I have a family picture of our whole clan (ten sons and daughters and their spouses and all of their children), which was taken in the east side yard of that house after our Thanksgiving feast. All of those Aunts and Uncles are gone now but there are a few cousins left scattered around the country. My cousin Linda still lives on a ranch outside Hollister and my cousin Frank, whom I thought was living in the San Diego area, now lives in Redmond, Washington just 90 miles and a ferry boat ride from my wife and me. Some of you who live in Hollister may be familiar with what is referred to by many as “The Birdcage House” on South and West Streets. That used to be where my Uncle Brick (Earl) Sparling, his wife, my Aunt Jean (Hawkins) Sparling and their three children, Earl Jr. (Sonny), Tom and Linda lived. It was just a block from their house to the house I previously described, and my cousin Frank taught me to roller skate on the sidewalk between the two houses. I took many a nose dive on that sidewalk until I learned where all of the Calaveras fault line branches were. There are other memories I could write about like trips with my dad and mom out to the Las Viboras Ranch after Brick and Jean moved from the house in town; trips dad and I took out to the old ranch in Panoche where he grew up; and a trip from Panoche to Los Banos over a road cut with a bulldozer where we crossed a couple of bridges my grandfather built and where we had to ford the creek where there were no bridges. I told you I am old. Freeways were not even a thought in anyone’s mind when I was a kid but we got there just the same. It just took longer and gave us more time for counting cows and carrying on conversations. We had to talk to each other back then; we didn’t have any I-thingies. To Su-sieee! Mac, the hostess of this amazing web site, I must say thanks for your amazing site and thanks for rewinding the tape of my life so I could play it again.